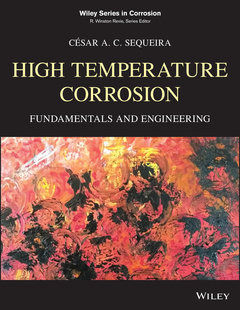 High Temperature Corrosion Sequeira César A. C.
Author: Sequeira César A. C.
Add to cart the livre of Sequeira César A. C.
High-temperature corrosion (HTC) is a widespread problem in an array of industries, including power generation, aerospace, automotive, and mineral and chemical processing, to name a few. This book provides engineers, physicists, and chemists with a balanced presentation of all relevant basic science and engineering aspects of high-temperature corrosion. It covers most HTC types, including oxidation, sulfidation, nitridation, molten salts, fuel-ash corrosion, H2S/H2 corrosion, molten fluoride/HF corrosion, and carburization. It also provides corrosion data essential for making the appropriate choices of candidate materials for high-temperature service in process conditions. A form of corrosion that does not require the presence of liquids, high-temperature corrosion occurs due to the interaction at high temperatures of gases, liquids, or solids with materials. HTC is a subject is of increasing importance in many areas of science and engineering, and students, researchers, and engineers need to be aware of the nature of the processes that occur in high-temperature materials and equipment in common use today, especially in the chemical, gas, petroleum, electric power, metal manufacturing, automotive, and nuclear industries. Offering balanced, in-depth coverage of the fundamental science behind and engineering of HTC, High Temperature Corrosion: Fundamentals and Engineering is a valuable resource for academic researchers, students, and professionals in the material sciences, solid state physics, solid state chemistry, electrochemistry, metallurgy, and mechanical, chemical, and structural engineers.